Kishin in Kyoto is all about breakfast. In fact, breakfast is the only meal served from when the doors open in the morning until well past noon. It’s an artful Japanese breakfast with a fair amount of “show and tell” about the origin of the food and the tableware it’s served in. The menu at Kishin is devised by Kyoto-born chef Atsushi Nakahigashi, who hails from Kyoto culinary royalty: his father runs Sojiki Nakahigashi, a two-star Michelin restaurant close to Ginkakuji temple, further north in the city. The younger Nakahigashi moved to the U.S. after finishing high school in Kyoto, and worked at Kajitsu, New York’s premier shōjin ryōri (Buddhist cuisine) restaurant. After leaving Kajitsu, Nakahigashi set up One Rice One Soup INC in 2015, a one-stop washoku (Japanese food) consultancy, which is how he got involved with Kishin, which opened in April, 2017. Kishin complements Nakahigashi’s greater aim of explaining washoku, but here it’s pared down to the first meal of the day. And yes, you’d be right in thinking there’s not a great deal of scope in the classic Japanese breakfast, which hinges on rice and soup, but the simple things are often the hardest to pull off well. Breakfast begins with a true Kyoto dish, a simple and small serving of kumiage–yuba (bean curd skin) folded over shredded cabbage and topped with a dot of wasabi. A hint of olive oil and soy sauce are folded into this delicate, creamy dish. It’s brief and ephemeral and will have you contemplating how it manages to feel so close to mayonnaise, but without the cloying sweetness. From here you can pick your main course, with a choice between a meat, fish or vegetable soup — the latter of which is suitable for vegans. I went with the shiro miso (white miso) pork soup. 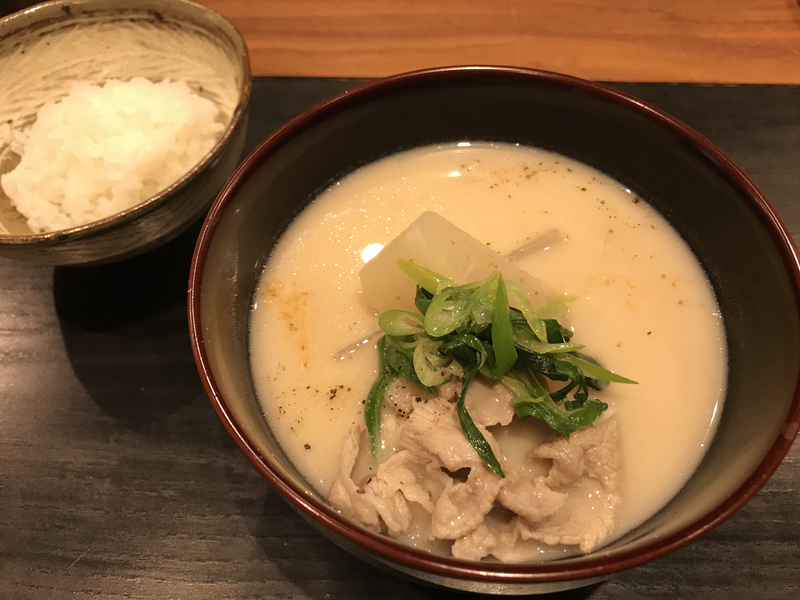 The soups are the standout dishes of the meal, and the shiro miso is something you’ll want to drink down: folded into the thin slices of pork were great wedges of delicately cooked daikon radish and carrot. 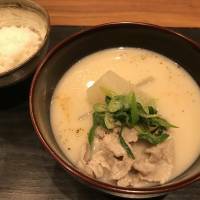 It’s one of the best breakfast soup dishes you’ll get in Kyoto. Anchoring the meal is the rice, small servings of just-cooked rice grown in Shiga Prefecture. While the rice servings are small, they keep coming and you needn’t be shy in asking for more. Before your rice is served, you get to choose a bowl, which is where the show and tell component comes in. Apparently, the well-crafted bowl I chose came from a craftsman in Nara Prefecture. You can also finish out your meal with an egg — cooked or raw — served over the rice. It’s a leisurely breakfast, though service may seem to lag at times for those operating on an empty stomach. There’s a side menu from which I ordered a plate of organic sausage that unfortunately never came. The home fries — another side dish — were spartan. Kishin has a bit more ironing out to do before it grows into its role as a showcase for breakfast in Kyoto.